Shadé Zahrai, Helping to make the world a better place – One happy person at a time. We’ve all heard it before. But what is a comfort zone? What does it actually mean in practice? What does it look like? Is there any real benefit to it or will you just make a fool of yourself? And are there things that you can do each day to get better at it? These were questions that I was asking myself recently when I had to really step out of my comfort zone. And as someone keenly interested in human performance, it compelled me to study some of the research around this topic. You can watch the 3minute TED video here. Five years ago, “Giving a TED Talk” was at the top of my list of ‘Goals I wanted to achieve.’ But as the years rolled on I started to give up the dream. Then in 2017, everything changed. Unexpectedly, I was given the opportunity to be involved in a TED Event, but in a slightly unconventional way…a way that forced me out of my comfort zone. On Monday 11 December 2017, Westpac hosted Australia’s first official TED conference at the Hordern Pavilion, Sydney. Instead of delivering a conventional speech, I managed to create something different, far more challenging and special for me. Here’s why. I’ve been a Latin dancer for almost a decade now. It was something that I fell into, fell in love with and eventually, along the journey, managed to win three Australian championship titles. The passion evolved into more than just an after work hobby. But this was something that I avoided sharing outside the dance scene. A few years ago, when I was still in the legal profession, some male colleagues saw an online video of me performing with my dance partner. This seemed funny to them and so they didn’t hesitate to make inappropriate derogatory jokes during a meeting, in my presence. I was hurt, embarrassed and for years I decided to keep that part of my life private from my professional circle. I never imagined that someday I would merge my love of dance with speaking, let alone on TED. I never thought that through I could provoke an audience to shift their perspectives and to think differently. But that’s what I decided to do. 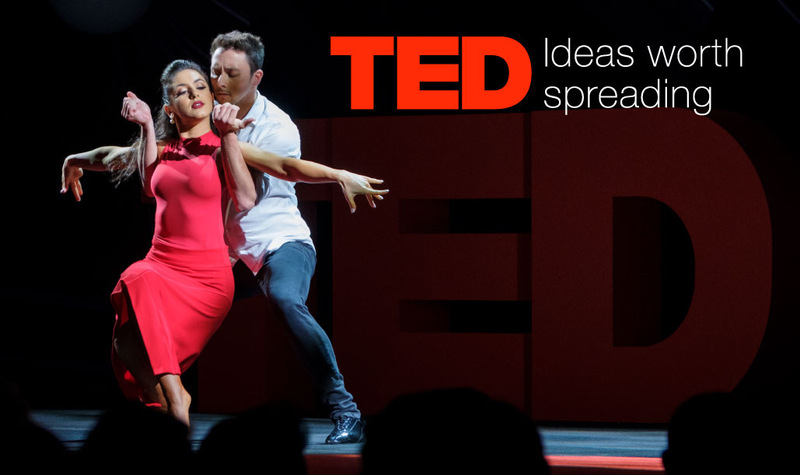 In the spirit of TED’s motto, ‘ideas worth spreading’, I chose to work with one of Australia’s most renowned Ballroom Dancers, Dancing with the Stars’ Aric Yegudkin, and together we created a narrative dance performance which was choreographed to be both impactful yet motivating. Entertaining while inspiring. Infused with a message that is close to my heart. The journey wasn’t so easy. I had to commit to a dancing style that’s foreign to me. I didn’t know how the audience would respond to a narrated dance performance. Speaking and Dancing were two different passions of mine, but bringing the two together on a very public stage like TED, untested, was scary… I’d have to fly between 2 cities in order to rehearse with Aric while working, completing a Masters degree, delivering speaking engagements and planning for a wedding (my own!) scheduled only a week before TED. After months of uncertainty, I found myself on stage and it was actually happening. We actually made it. It turned out to be an incredible experience for me as an artist, a performer and a speaker. It was definitely outside of my comfort zone. For the first time I was able to embrace my authentic self, without fear of how my colleagues in the ‘corporate world’ would perceive it. The piece I created for TED was different. It was risky. I had no idea how it would be received. No idea if people would like it. If they’d understand. If they’d resonate. It was certainly pushing the boundaries of my own personal comfort zone. Yet, it was something that I genuinely wanted to do. And you know what? That’s the point. We shouldn’t be afraid to be different, to challenge convention and to honestly express ourselves. To speak our truth. To embrace who we are and go outside our comfort zones. So then, how do we know what is within our comfort zone and what lies beyond it? And how do we make sure we don’t bite off more than we can chew? Each of us has our own comfort zone. You have one. I have one. Your momma has one… It’s a psychological, emotional or behavioural space where you think and act in ways that minimise risk and stress (Yerkes and Dodson, 1908). It provides a state of mental security. It’s easy. Comfortable. There’s no risk of failure. But, experiencing a little stress now and then is actually a good thing. Without it, you won’t experience anything new – no challenges, no risks, and no growth. Basically, you don’t learn if you’re comfortable. But what if you go too far outside of your comfort zone, into a place where it’s just too stressful and you don’t feel like you have any chance of succeeding? Well, this place actually exists and even has a name. It’s known as the Zone of Destructive Anxiety. Here, as the name makes obvious, you’re actually too stressed to be productive. You may be jittery, your heart-rate may be racing, you’re unable to focus and could have clouded judgment. Your performance drops off sharply. Your state becomes a destructive force. Hmm, doesn’t sound so good. Where you actually want to be is somewhere between your Comfort Zone and your Zone of Destructive Anxiety. Here you’ll find a happy place. This in-between space is ideal for learning and growth. Developmental psychologist Lev Vygotsky refers to this as the Zone of Proximal Development (also known in sport as the Zone of Optimal Anxiety – Hanin, 1980). It’s exactly where we want to be. But why? Well, in simple terms, the Zone of Proximal Development is the space where you’re challenged, but if you put in the extra effort or seek the support you need you can achieve the outcome. You have just enough stress to keep you engaged and focussed – you have keener intellect, sharper problem solving skills and the commitment to complete the task or seek out the help you need. It allows you to stretch and learn, while still being able to achieve. This positive relationship between performance and stress is known as the ‘Yerkes-Dodson Law’ (you can read more about it in an interesting Harvard Business Review article here). Interesting stuff! Can you think of examples of when you found yourself in either the Zone of Destructive Anxiety (horror!) or the Zone of Proximal Development (total flow..)? Being involved in TED was an experience that showed me the value of escaping my own comfort zone and proved to me that we’re all far more capable than we think. So next time you’re faced with an opportunity to do something that makes you feel a little uncomfortable, go for it! Shadé Zahrai is an author, consultant, former lawyer, trainer, speaker, Future Leader Scholar (through the Westpac Bicentennial Foundation) and champion latin dancer who has been featured on TED. Shadé specialises in translating brain science research into simple, actionable strategies for performance and wellbeing. She is passionate about empowering women and minorities to challenge unconscious bias, drive inclusion and advance equality in the workplace and our communities. Her mission is to help make the world a better place – One happy person at a time.